The feeling of gladness and rejoicing. Cant. R. i. 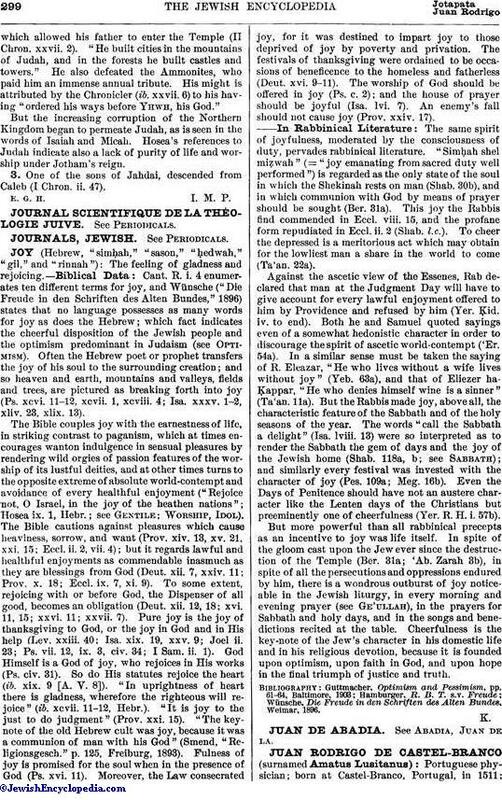 4 enumerates ten different terms for joy, and Wünsche ("Die Freude in den Schriften des Alten Bundes," 1896) states that no language possesses as many words for joy as does the Hebrew; which fact indicates the cheerful disposition of the Jewish people and the optimism predominant in Judaism (see Optimism). Often the Hebrew poet or prophet transfers the joy of his soul to the surrounding creation; and so heaven and earth, mountains and valleys, fields and trees, are pictured as breaking forth into joy (Ps. xcvi. 11-12, xcvii. 1, xcviii. 4; Isa. xxxv. 1-2, xliv. 23, xlix. 13). The Bible couples joy with the earnestness of life, in striking contrast to paganism, which at times encourages wanton indulgence in sensual pleasures by rendering wild orgies of passion features of the worship of its lustful deities, and at other times turns to the opposite extreme of absolute world-contempt and avoidance of every healthful enjoyment ("Rejoice not, O Israel, in the joy of the heathen nations"; Hosea ix. 1, Hebr. ; see Gentile; Worship, Idol). The Bible cautions against pleasures which cause heaviness, sorrow, and want (Prov. xiv. 13, xv. 21, xxi. 15; Eccl. ii. 2, vii. 4); but it regards lawful and healthful enjoyments as commendable inasmuch as they are blessings from God (Deut. xii. 7, xxiv. 11; Prov. x. 18; Eccl. ix. 7, xi. 9). To some extent, rejoicing with or before God, the Dispenser of all good, becomes an obligation (Deut. xii. 12, 18; xvi. 11, 15; xxvi. 11; xxvii. 7). Pure joy is the joy of thanksgiving to God, or the joy in God and in His help (Lev. xxiii. 40; Isa. xix. 19, xxv. 9; Joel ii. 23; Ps. vii. 12, ix. 3, civ. 34; I Sam. ii. 1). God Himself is a God of joy, who rejoices in His works (Ps. civ. 31). So do His statutes rejoice the heart (ib. xix. 9 [A. V. 8]). "In uprightness of heart there is gladness, wherefore the righteous will rejoice" (ib. xcvii. 11-12, Hebr.). "It is joy to the just to do judgment" (Prov. xxi. 15). "The key-note of the old Hebrew cult was joy, because it was a communion of man with his God" (Smend, "Religionsgesch." p. 125, Freiburg, 1893). Fulness of joy is promised for the soul when in the presence of God (Ps. xvi. 11). Moreover, the Law consecrated joy, for it was destined to impart joy to those deprived of joy by poverty and privation. The festivals of thanksgiving were ordained to be occasions of beneficence to the homeless and fatherless (Deut. xvi. 9-11). The worship of God should be offered in joy (Ps. c. 2); and the house of prayer should be joyful (Isa. lvi. 7). An enemy's fall should not cause joy (Prov. xxiv. 17). The same spirit of joyfulness, moderated by the consciousness of duty, pervades rabbinical literature. "Simḥah shel miẓwah" (= "joy emanating from sacred duty well performed") is regarded as the only state of the soul in which the Shekinah rests on man (Shab. 30b), and in which communion with God by means of prayer should be sought (Ber. 31a). This joy the Rabbis find commended in Eccl. viii. 15, and the profane form repudiated in Eccl. ii. 2 (Shab. l.c.). To cheer the depressed is a meritorious act which may obtain for the lowliest man a share in the world to come (Ta'an. 22a). Against the ascetic view of the Essenes, Rab declared that man at the Judgment Day will have to give account for every lawful enjoyment offered to him by Providence and refused by him (Yer. Ḳid. iv. to end). Both he and Samuel quoted sayings even of a somewhat hedonistic character in order to discourage the spirit of ascetic world-contempt ('Er. 54a). In a similar sense must be taken the saying of R. Eleazar, "He who lives without a wife lives without joy" (Yeb. 63a), and that of Eliezer ha-Ḳappar, "He who denies himself wine is a sinner" (Ta'an. 11a). But the Rabbis made joy, above all, the characteristic feature of the Sabbath and of the holy seasons of the year. The words "call the Sabbath a delight" (Isa. lviii. 13) were so interpreted as to render the Sabbath the gem of days and the joy of the Jewish home (Shab. 118a, b; See Sabbath); and similarly every festival was invested with the character of joy (Pes. 109a; Meg. 16b). Even the Days of Penitence should have not an austere character like the Lenten days of the Christians but preeminently one of cheerfulness (Yer. R. H. i. 57b). But more powerful than all rabbinical precepts as an incentive to joy was life itself. In spite of the gloom cast upon the Jew ever since the destruction of the Temple (Ber. 31a; 'Ab. Zarah 3b), in spite of all the persecutions and oppressions endured by him, there is a wondrous outburst of joy noticeable in the Jewish liturgy, in every morning and evening prayer (see Ge'ullah), in the prayers for Sabbath and holy days, and in the songs and benedictions recited at the table. Cheerfulness is the key-note of the Jew's character in his domestic life and in his religious devotion, because it is founded upon optimism, upon faith in God, and upon hope in the final triumph of justice and truth. Wünsche, Die Freude in den Schriften des Alten Bundes, Weimar, 1896.